Effective engagement marketing programs comes from inspiring the right customers to move towards your brand. You don’t want to waste your marketing dollars on someone who will never like your brand or speak kindly about it no matter what you do. Nor do you want to drive off customers who love your brand with unappealing messages. 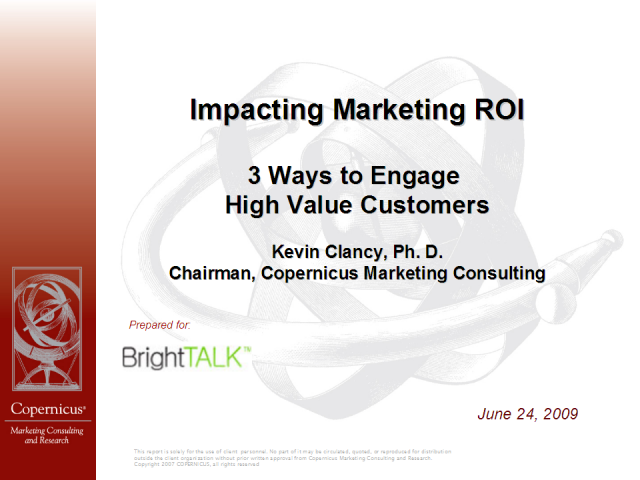 Marketing strategy expert and author Kevin Clancy will talk about how to identify the high-value folks you truly want to engage with your brand and how to inspire positive interaction. He will show the payoff of infusing insights about customers into marketing strategy decisions using case studies and real-world examples.